Two Cards in ONE Weekend! Today I took a short break from drawning images for my other site, DigiDrawn and got back to creating another Tilda card! This Spellcaster Tilda was purchased months ago, but I had yet to ink her up! 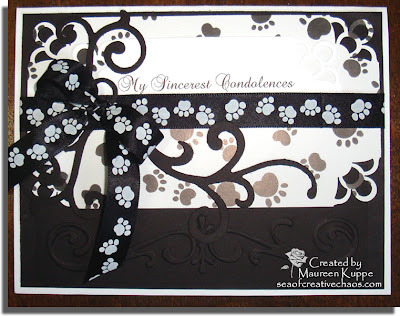 This card was kind of an experiment. I really didn't know what colours to use... so I DIDN'T! I decided on simply Copics C0 to C6. The only colours this card has is the reflective rainbows the beautiful prism paper gives off. 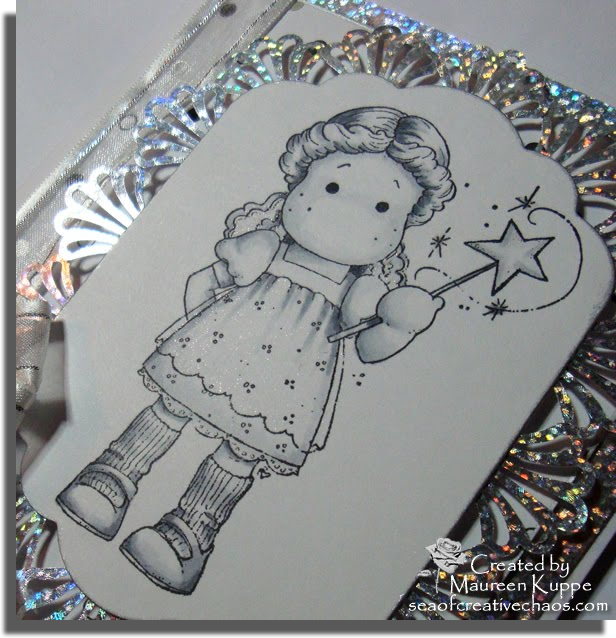 I thought this paper, which was a gift from a new friend, would give the card it's magic; it changes depending upon how you hold it! The prism paper was used as the mat under the TPC Studio Class Act Dots patterned paper. I punched out 16 Martha Stewart's Deco Fan corners and taped them individually around the Spellbinders die-cut Tilda image. 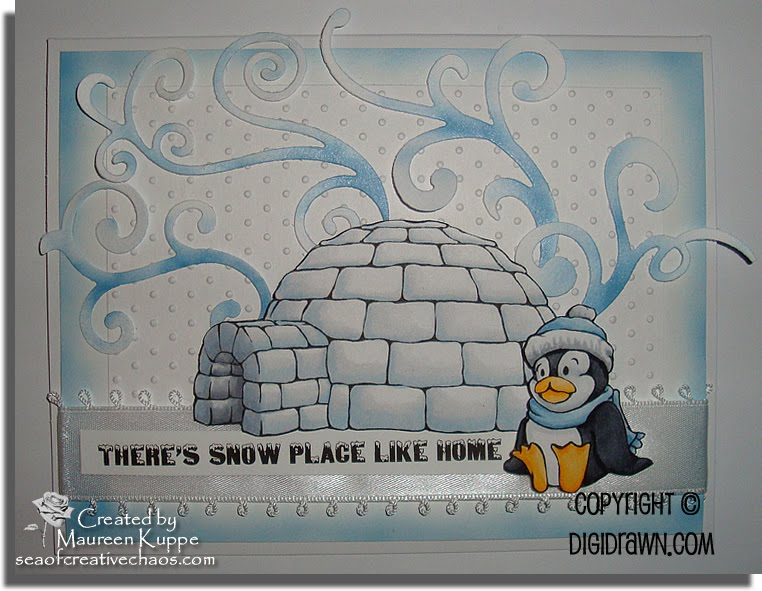 I inked the edge with Color Box silver ink and popped it up on foam dimensionals. The ribbon is from the Dollar Store. Inside the card it says "a very magical birthday!" Now that was a fun break! With the title of "Official Card Maker" for our office, it gives me a lot of opportunities to play in my craft room, which is where I whipped up this quick card last night. Yep, another birthday card for a co-worker. With each one I try to think of what the person receiving it is like. This woman likes black and not into pinky-frilly-girly things. 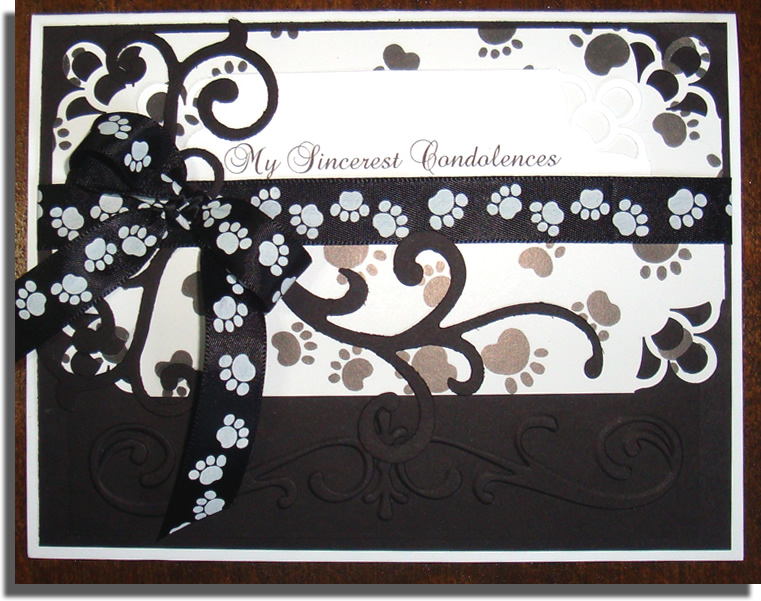 I hope this black and beige card meets with her approval. Sure, there are flowers, but I painted them with my Copics: black (100) and warm gray (W7). They used to be purple!. 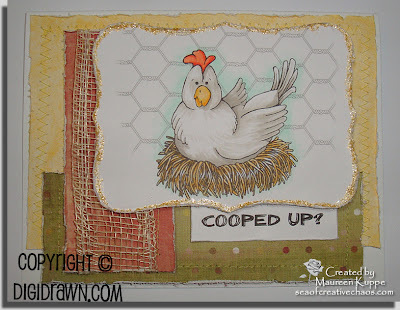 I started this card with that little piece of patterned paper I had in my scrap drawer. 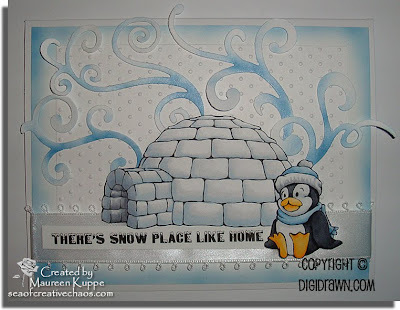 From there, I found cardstock to match and used my Cuttlebug to emboss the design. 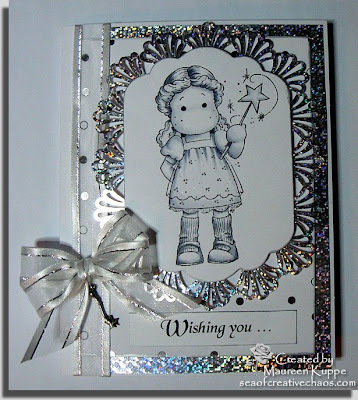 That embossing folder was a gift from a new friend who had a duplicate! Lucky me! A strip of ribbon and old silver brad from my stash went along perfectly with the flower. 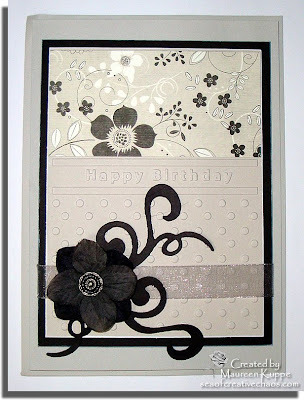 I decided to jazz it up a tad with a few black swirls I had already cut using my Sizzix die in the Cuttlebug. The only other additon to this card was the Color Box white ink that I edged the papers with. I like the way this came together; I even had a base card and envelope in the perfect hue to match! Wow, what a busy weekend! In between the usual necessary chores, I was able to get two cards done. The one above was created to showcase my newest digi stamp "Chicken" that can be purchased at DigiDrawn here. It was a special request by a reader. So glad I was able to finish it up and do a sample card too! 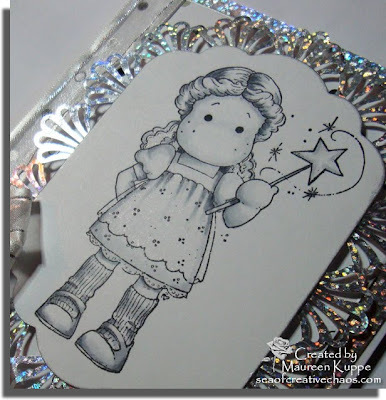 Details on how I made the card and coloured the image can be found over at DigiDrawn. I used my Cuttlebug to emboss the black background paper and also to cut the Sizzix dies for the swirls. A Martha Stewart punch (Double Loops) was used on the corners. Especially on a bitterly cold day! Brrrrr! 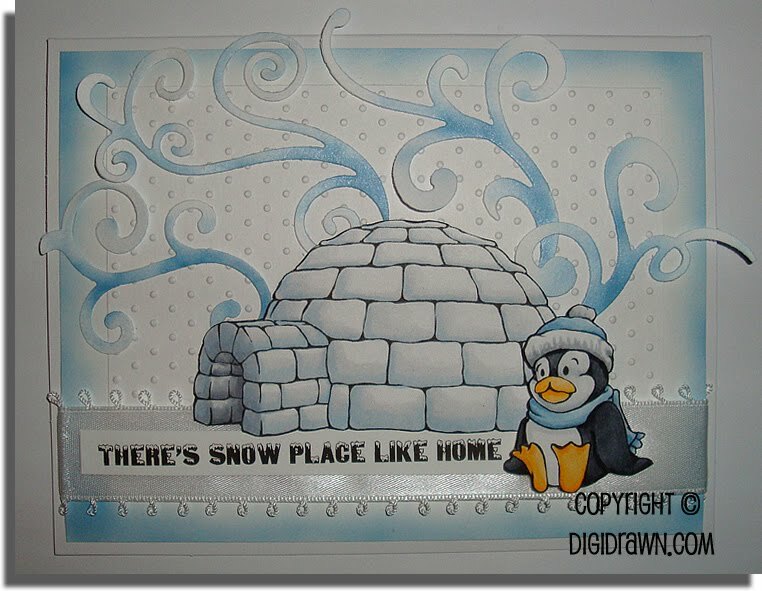 Here's a card featuring my newest digistamps, Penguin and Igloo. They can be purchased over at my DigiDrawn site! This card also marks the first time I've tried a new toy I received for Christmas - my Copic airbrush! I used it to colour the background and the swirls with B91 and B93. The ribbon is from my stash and the sentiment is computer generated. Keep warm - stay indoors!